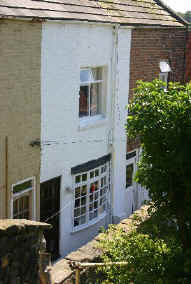 Traditional 2 bedroom fisherman’s cottage, in a peaceful cobbled yard, a minute away from busy Church street in the heart of Whitby old town. (picture left is of cottage). Newly decorated & furnished to a high standard. The cottage has an open aspect and enjoys views over the rooftops towards the West Cliff. The sea can be seen from the top floor. Free parking for 1 car in nearby car park. The cottage has 3 floors, the first and second being reached by steep, twisting staircases. There is a dining kitchen, living room (with double sofa bed) on the ground floor, twin bedroom and bathroom on the first floor and a double bedroom on the second floor. It is furnished with a mixture of antique and contemporary furniture, and is newly carpeted throughout. Kitchen - Microwave, fridge with icebox, oven and separate hob, toaster, washing machine and iron. The cottage is open all year, and is snug and warm with gas central heating and a living flame gas fire. (picture above is bedroom with king-size double bed). This traditional fisherman's cottage is reached by several short flights of steps leading from White Horse Yard. Short breaks are available starting from £150.